The Norcross Garden Club announced the winners of the 2017 Wild & Wonderful Environmental Youth Summer Camp while attending an event at the Norcross Discovery Garden Park. 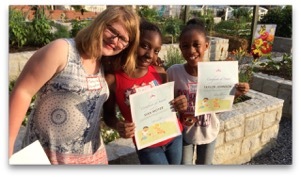 The winners, Taylor Johnson, Sian Moyer, and Makayla Youngker won scholarships to this year’s camp by writing why they thought they should attend the camp. All three girls are from Peachtree Elementary, are 5th graders, and as it happens, attend the same Girl Scout Troop. Club members were happy to have the opportunity to choose and purchase from perennials like Euphorbia, Foxglove, Heuchera, Juncus, and Golden Thread. It costs $125 per student to attend the Camp and the Norcross Garden Club members were excited they would be sending three deserving students this year. The 10th annual 2017 Wild & Wonderful Environmental Youth Summer Camp is sponsored by the Garden Club of Georgia and takes place in Mansfield, Georgia at the Charlie Elliott Wildlife Center. This Camp is geared to rising 5th and 6th graders from around the state. Campers can fish, plant a container garden, star gaze, learn more about water conservation, and absolutely have fun learning how all this and more give way to leaving behind a world that is better tomorrow than yesterday. The Norcross Garden Club is an IRS registered 501(c)(3) non-profit organization.